These homemade brownies are fudgy, moist, and made with pureed garbanzo beans! Forget the boxed brownie recipe and whip up a batch for a healthier dessert this week. 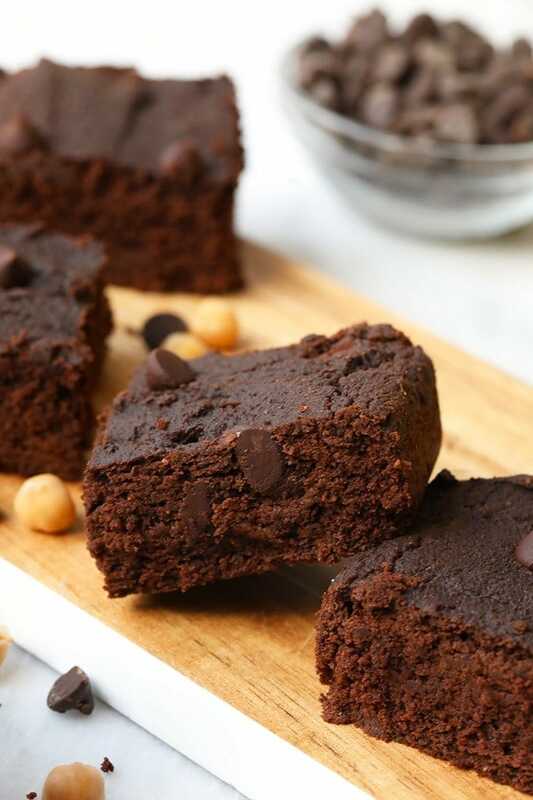 These Fudgy Homemade Brownies with Garbanzo beans are packed with extra protein, fiber, but will still satisfy your sweet tooth! Happy Friday, FFF friends! Today is our first day back from our Thrifty Traveler trip to Las Vegas! If you followed us on Instagram for the trip, you know that we didn’t do your typical Vegas trip and MAN was it a blast! We can not wait to tell you all about it. Make sure you keep an eye out for our posts on where we stayed, what we ate, and what we climbed. Yes, CLIMBED. WOO. 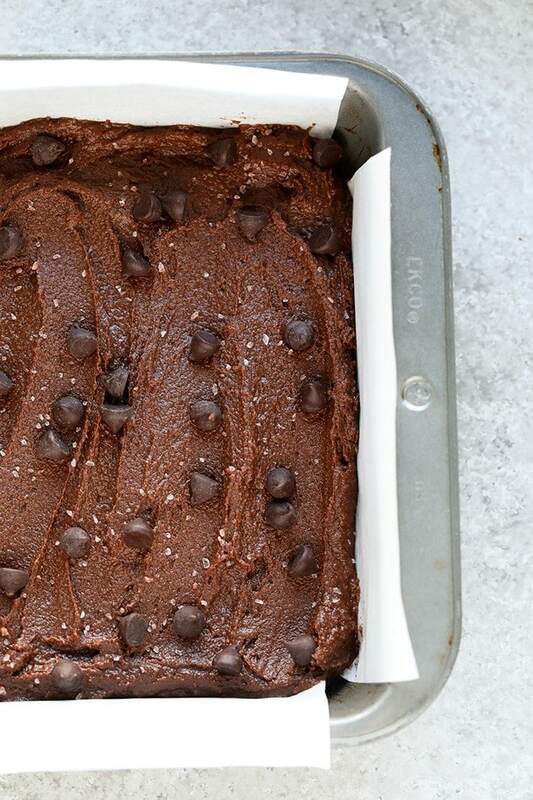 Now, brownies. There is nothing like a delicious brownie to really make it a good day. 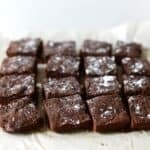 Wheather you start your day off with a cup of coffee and one of these fudgy homemade brownies or end your day with a treat it seems that brownies are always a good idea! Can I get an AMEN? We originally made these healthy homemade brownies in 2013. It is one of the recipes we found where the recipe was pretty quality but the photos needed some work. 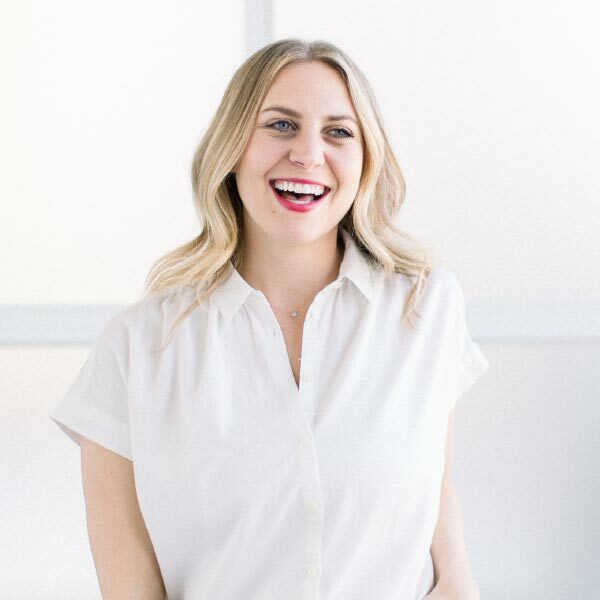 We LOVE sneaking healthy ingredients into baked goods. More specifically, pureed fruits and vegetables. 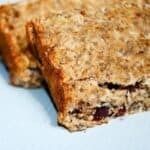 Have you tried our Sneaky Beet Brownies or our Healthy Whole Wheat Pumpkin Walnut Bread? One is made with beet puree and the other with pumpkin. 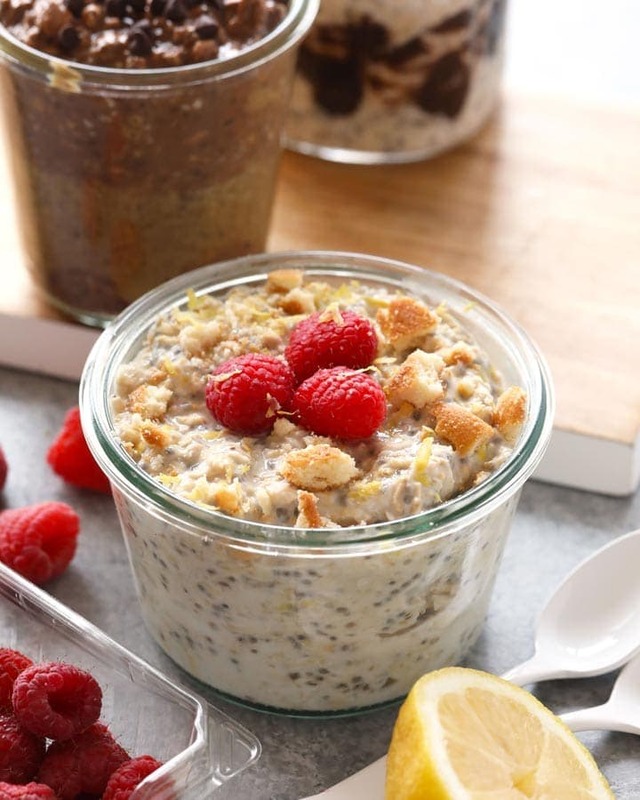 It is just a great way to give some extra nutrients and moisture to a recipe! 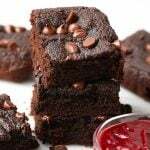 We originally made these brownies with garbanzo bean flour but thought pureed garbanzo beans were definitely the way to go. 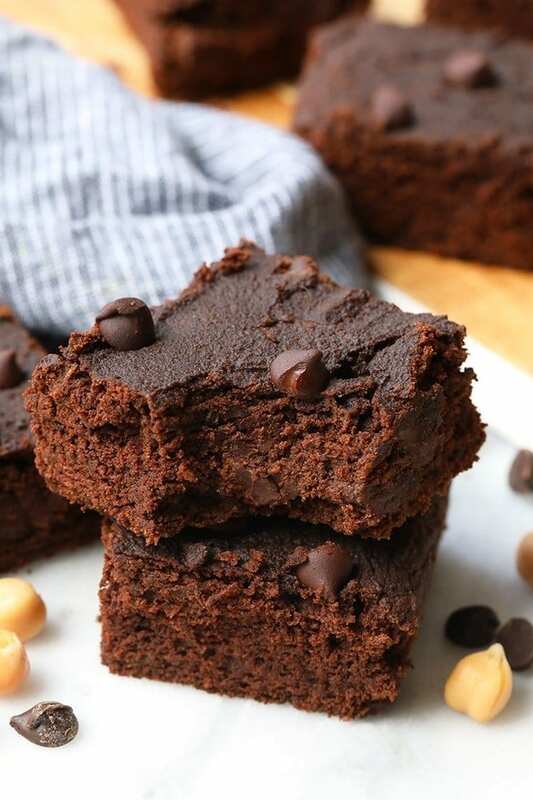 Other than being absolutely delicious these Fudgy Homemade Brownies with Garbanzo Beans are made from mostly pantry staples! 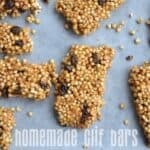 That means that if you try to keep your pantry stocked with staples, you will have the ingredients for these delicious easy bronies in your pantry already! Below are some staple pantry items if you want to stock up. Enjoy and let us know what you think! Preheat the oven to 325ºF and prep an 8×8 baking pan by for 23 minutes. In a medium-sized bowl, mix all of the dry ingredients together and set aside. Next, place garbanzo beans, maple syrup, vanilla extract, and almond milk into a food processor or blender and blend until smooth. 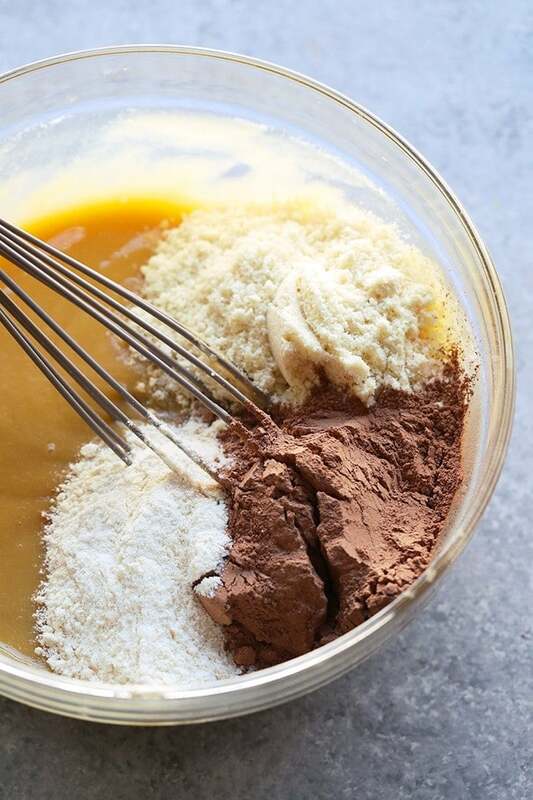 In a separate bowl, whisk eggs together and slowly whisk garbanzo bean mixture and eggs together (wait to add melted chocolate chips and coconut oil until the end). Slowly add your dry ingredients to wet ingredients and when everything is mixed, slowly add in melted chocolate chips and coconut oil. When all of the ingredients are well combined, pour batter into baking pan. Place in the oven and bake for 23-25 minutes.